Many Georgia parents are saying prayers of thanks tonight that no one was injured in the latest bus crash in Georgia. This latest crash near Macon, Georgia involved a bus loaded with Gwinnett County students coming home from Orlando, Florida following a school choir trip. Many of the bus passengers were injured, many with broken bones and other orthopedic injuries. I am sure this most recent bus crash has reminded many of us of the Bluffton, Ohio bus crash, also on I-75, that occured in 2007 here in Atlanta. Obviously, a parent’s worse nightmare. 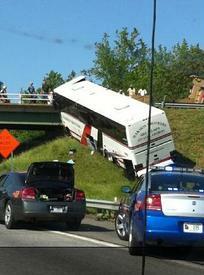 Reports indicate the bus driver may have been following another vehicle too closely, leading to the wreck. Parents also report not being told of the accident for hours. Forty-seven (47) passengers were reportedly injured. This bus crash also brings to light the issue of having seatbelts in buses, and I mean buses of any type, from charter buses like this one to Georgia school buses. With Bluebird bus manufacturer in Georgia, the country’s largest manufacturer of school buses right here in our very own state, it makes one wonder how many more people, including children, will have to be injured before seatbelts are made mandatory. I advocated this back in 2007 with the Bluffton crash. Had there been seatbelts in the Bluffton bus, lives would have been saved and young men would not have become paralyzed. Some strong issues to consider, but for now, all Georgians should join these parents in those grateful prayers for the lives of their children.